CELEBRATION POINTE 188 • SHOPPING CENTER BUSINESS • May 2018 a local software giant, Info Tech, and additional tenants will be moving in throughout the summer." The short supply of Class A, high-end office space in Gainesville is leaving some to wonder if another office building could be part of future phases. InfoTech occupied its space in 2017 with more than 240 employees. Its three-level, 60,000-square-foot office building was designed by Cleveland, Ohio-based Cupkovic Architecture, and is pursuing LEED Silver certification. Another district of the project is The Commons, a service-oriented retail proj- ect off Archer Road at one of Celebration Pointe's main en- trances. Tenants there include Starbucks and Wawa. The Shops at Celebration Pointe is a neighborhood-type retail environment where new tenants will open later this summer. 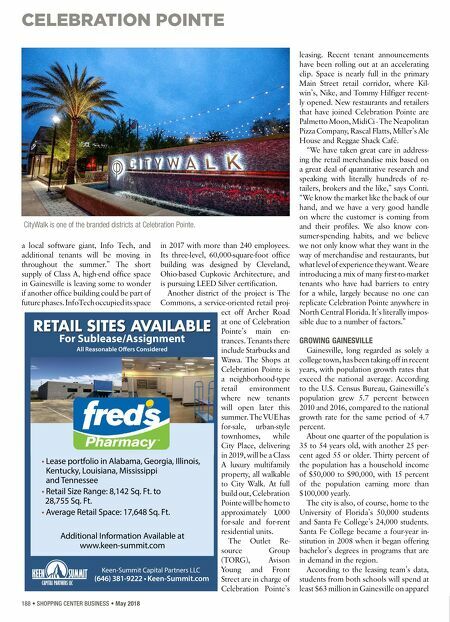 The VUE has for-sale, urban-style townhomes, while City Place, delivering in 2019, will be a Class A luxury multifamily property, all walkable to City Walk. At full build out, Celebration Pointe will be home to approximately 1,000 for-sale and for-rent residential units. The Outlet Re- source Group (TORG), Avison Young and Front Street are in charge of Celebration Pointe's leasing. Recent tenant announcements have been rolling out at an accelerating clip. Space is nearly full in the primary Main Street retail corridor, where Kil- win's, Nike, and Tommy Hilfiger recent- ly opened. New restaurants and retailers that have joined Celebration Pointe are Palmetto Moon, MidiCi - The Neapolitan Pizza Company, Rascal Flatts, Miller's Ale House and Reggae Shack Café. "We have taken great care in address- ing the retail merchandise mix based on a great deal of quantitative research and speaking with literally hundreds of re- tailers, brokers and the like," says Conti. "We know the market like the back of our hand, and we have a very good handle on where the customer is coming from and their profiles. We also know con- sumer-spending habits, and we believe we not only know what they want in the way of merchandise and restaurants, but what level of experience they want. We are introducing a mix of many first-to-market tenants who have had barriers to entry for a while, largely because no one can replicate Celebration Pointe anywhere in North Central Florida. It's literally impos- sible due to a number of factors." GROWING GAINESVILLE Gainesville, long regarded as solely a college town, has been taking off in recent years, with population growth rates that exceed the national average. According to the U.S. Census Bureau, Gainesville's population grew 5.7 percent between 2010 and 2016, compared to the national growth rate for the same period of 4.7 percent. About one quarter of the population is 35 to 54 years old, with another 25 per- cent aged 55 or older. Thirty percent of the population has a household income of $50,000 to $90,000, with 15 percent of the population earning more than $100,000 yearly. The city is also, of course, home to the University of Florida's 50,000 students and Santa Fe College's 24,000 students. Santa Fe College became a four-year in- stitution in 2008 when it began offering bachelor's degrees in programs that are in demand in the region. According to the leasing team's data, students from both schools will spend at least $63 million in Gainesville on apparel Keen-Summit Capital Partners LLC (646) 381-9222 • Keen-Summit.com RETAIL SITES AVAILABLE For Sublease/Assignment All Reasonable Offers Considered • Lease portfolio in Alabama, Georgia, Illinois, Kentucky, Louisiana, Mississippi and Tennessee • Retail Size Range: 8,142 Sq. Ft. to 28,755 Sq. 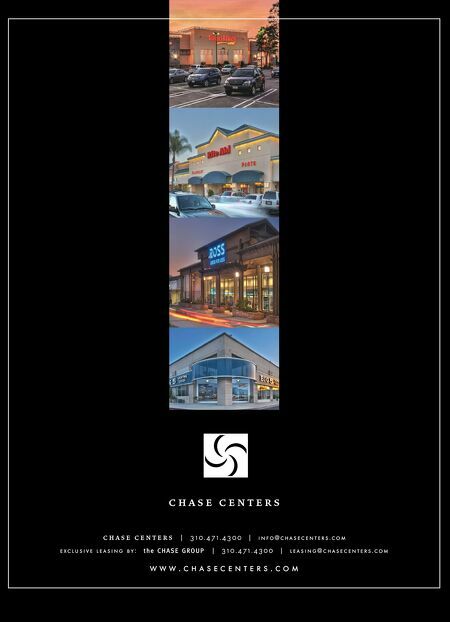 Ft. • Average Retail Space: 17,648 Sq. Ft. Additional Information Available at www.keen-summit.com CityWalk is one of the branded districts at Celebration Pointe.